I read this article and found it very interesting, thought it might be something for you. The article is called In Bihar’s Political Realignment, Women Suffer and is located at https://archive.indiaspend.com/bihar-votes-for-its-and-indias-future/in-bihars-political-realignment-women-suffer-88292. As a first-time member of the legislative assembly (MLA) in Bihar, Jyothi Devi, 46, did well over her five-year term: She had 10 bridges—some of which were demanded since independence—and 3,300 km of roads constructed in her constituency, Barachatti, including several link roads connecting villages to the Grand Trunk Road that cuts across Gaya district, where Barachatti is located. Jyothi Devi got the NGO that she runs to work with a British-government agency to survey poor homesteads and arranged for 900 families to get land titles. She has been a vocal participant in the legislative assembly, the Vidhan Sabha, asking more than 250 questions. Before she became a legislator, Jyothi Devi was not new to development work, having organised self-help groups and anganwadi (child care) centres for the MahaDalit (most backward), rat-catching Musahar community. Impressed by her work, Bihar Chief Minister and the Janata Dal (United) leader Nitish Kumar personally asked her to contest the assembly elections in 2010. Yet, when tickets for the on-going Bihar elections were announced, she was one among many women MLAs not given a ticket. “Hum toh wait karte rahe ki hamara kaam dekhke humko ticket zaroor milega. Humko Manjhi ji ka samdhan hone ka saza mil raha hai”, (I was waiting for a party ticket considering my work. I am being punished for being related to [former Chief Minister Jitan Ram] Manjhi,” she said ruefully. Jyothi Devi, whose daughter is married to Manjhi’s son, is a casualty of the fallout between Kumar and Manjhi, who broke away from JD(U) to form the Hindustan Awam Morcha, an alliance partner of the BJP-led National Democratic Alliance (NDA). However, there are many women MLAs who have been left out and their seats given to male candidates. Bihar is one of the states that have shown progress in women’s political empowerment over the last decade. As IndiaSpend reported earlier, the vidhan sabha in 2010 had the highest-ever population of female MLAs (34) in Bihar’s history. Women MLAs constituted 14% of MLAs, next only to Haryana (14.4%). Women make up 48% of the state’s 104 million people. Bihar was also the first state to reserve 50% seats for women in panchayats (village councils). As many as 273 women are contesting the current elections, against 306 women who contested in 2010, according to data compiled by Association of Democratic Reforms, a non-governmental organisation working in the area of electoral and political reforms. As a proportion of total contestants, women make up 8% of the total contestants as against 8.75% in 2010. Almost all major political parties have distributed fewer tickets to women than in the previous years. Most parties gave less than 10% of their tickets to women, the exceptions being the Indian National Congress (INC), the Nationalist Congress Party (NCP) and the Hindustani Awam Morcha (HAM). The Left parties are among the worst in terms of gender parity, with the Communist Party of India (CPI) giving about 2% tickets to women. The result: These elections–as we explain later in this piece–are seeing more women contesting as independents than ever before. Source: Association for Democratic Reforms. While the BJP gave one more ticket to a woman candidate than it did in 2010, the proportion of female candidates fell from 12.8% to 8.9%. Almost all other parties have given fewer tickets –both in absolute and percentage terms. Source: Association for Democratic Reforms. ; Note: In 2000, Bihar and Jharkhand had not split and the total assembly seats were 324. The most notable reversal of female political empowerment comes from a man who has, in the past years, enabled this empowerment: Nitish Kumar. Kumar’s push for gender equality and other gender-friendly policies is well documented: He was the first chief minister in the country to legislate 50% reservation of seats for women in panchayats. His party, the JD(U), had steadily increased female candidates, from 2% in 2000 to 11.5% in 2005. In 2010, 17% of party candidates were women, the highest ever by any political party in Bihar. As we said, that is now down to 10%. Kumar has given tickets to only nine of 22 women MLAs from the JD(U) and one ticket to a new candidate. He has replaced six female candidates with male candidates, two of them being husbands of former MLAs. Former deputy chief whip Neeta Chaudhry has been replaced by her husband, Mewalal Chaudhry, from Tarapur while Praveen Shukla is contesting the elections from Lalganj, replacing his wife Annu Shukla, the current MLA. Political realignment has meant that Kumar had to allocate four of these seats to former chief minister Lalu Prasad Yadav’s Rashtriya Janata Dal (RJD) and one to Congress. The RJD has fielded male candidates in two constituencies–Nawada and Hilsa–and women in the other two–Runsaidpur and Barachatti. The Congress has fielded a male candidate in Govindganj, hitherto held by Meena Dwivedi. What explains this sharp reversal in Kumar’s stand on female political participation? Some reports suggest the influence of Lalu Yadav, his major alliance partner, who has previously opposed a national law reserving 33% seats for women in Parliament and state assemblies. While Jyoti Devi does believe that Lalu Yadav influenced overall seat allocation, she is not convinced he was a factor in giving tickets to women candidates. Data disprove the popular myth about Lalu Prasad. The RJD has been steadily increasing the proportion of female candidates since 2000. Indeed, it is the only party to have given a marginally higher proportion of tickets to women in these elections, while the rest have reduced the tickets. The grand political realignment in Bihar has seen fewer tickets to women, with about 10% of female candidates in each major alliance. Contrast this with 2010, when the alliances had different constituents and the proportions of tickets to women were higher. That women are still struggling for increased political participation at national and state level is well established. Parties justify restricted political space by citing “winnability” as an impeding factor. However, data from Bihar tends to put the myth of female “winnability” to rest. In 2010, 33 of 34 women MLAs belonged to the then ruling combine of JD(U) and BJP, while one was an independent. The JD (U) fielded 24 women, of which 22 were elected to the legislative assembly, the Vidhan Sabha. 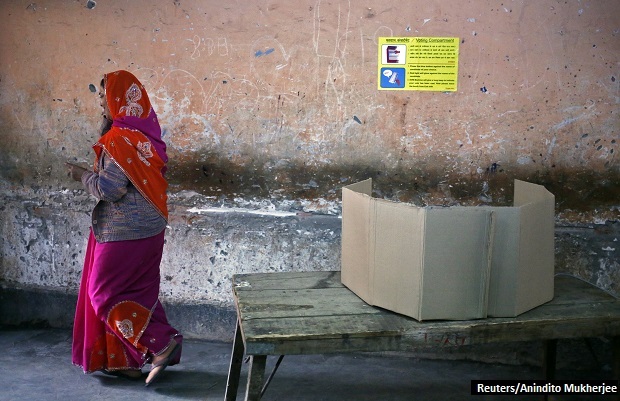 The BJP fielded 13 women; 11 were elected. This means 91% of JD (U) and 84% of BJP female contestants won. In 2005, the JD (U)’s female candidates won 12 of 16 seats they contested, while the BJP’s female candidates won four of nine constituencies they contested. Women voters have been at the forefront of political change and policy change in Bihar over the last two elections. They were largely responsible for Nitish Kumar’s victory, ending Lalu Yadav’s government in 2005. Voter participation among men declined three percent points; for women it was up two percent points, evident in the October 2005 elections, after a hung assembly that resulted after February polls that year. “Vote de mahila, lekin avsar mile purush ko. Yeh anyay hai” (Women vote but men get greater opportunity. This is unjust), said Jyothi Devi. “Election ladne mein kum se kum 50 lakh ka kharcha aata hai. Humare paas itna takat nahin hai. Aur aaj kal to chunaav bahut hi-fi ho gaya hai (It costs at least Rs 50 lakh to fight elections these days, which has become quite sophisticated. It is beyond my capacity),” Jyothi Devi said, asked if she did not consider contesting as an independent, given her popularity in her constituency. Difficulty in access to campaign finance is one of the impediments to greater female political participation, according to studies worldwide. The number of independent female candidates has risen in these elections: 81 women are contesting independently—7% of independent candidates—the highest ever in Bihar’s history; 31 women contested the 2010 elections as independents. While Jyothi Devi is disappointed at not being nominated to contest, she is happy that her constituency, Barachatti, has a female candidate, Samata Devi (RJD), strongly tipped to win. Whichever alliance wins, it is certain that the next Bihar vidhan sabha will see fewer women MLAs than the last time.